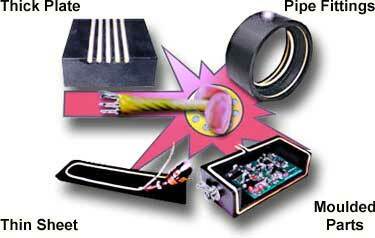 For welding, a voltage is attached between the fixed Heating-Welding-Rod an the neighbouring parts of PE or PP. The current warms up the heating spiral and the neighbouring laminated plastic. The liquid plastic of the Heating-Welding-Rod an the neighbouring parts flows together under adding pressure. After disconnecting the voltage the joint cools down underadding pressure, which solidifies the melt. The result is a firm welding joint, which is optically inconspicuous, because the joint is between the jointing parts. Heating-Welding-Rod and upper, as well as the lower jointing part were melted under adding tight pressure. After solidifiying under adding pressure, they form the firm welding joint together. Ask for welding-rod and voltage supplies for your application! Allready suitable and economically for small, middle numbers of parts, as well as for prototypes. Small building expenditure, especially for big jointing parts. Flexibly regarding the geometrie of the surface. Users are welding even under water !